Being a mother of two girls I am a total bow freak and always looking for the best deals, Sweet Baby Bowtique has just that! The owner Miranda is such a sweetheart and goes above and beyond to make sure her customers are completely satisfied and let's just say her bows are seriously adorable AND affordable, my two favorite words when it comes to bows! She makes Regular Bows, Monogrammed Bows, Double Layer Bows, Spiked Loopy Boutique Bows, Korkers, and Bows with Curly Cues! If you are a fan of BIG BIG bows, I would definitely recommend you to like her page and stay tuned, she has XXL in 3" width ribbon coming very soon! 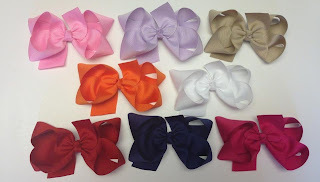 With that being said, Miranda definitely spoiled Lilyana for this review, she sent her a variety of colored bows for her new school year. Lily is completely in love with her bows and can't wait to wear them, she starts school September 3rd so these came just in time! I've always been hesitant about purchasing bows this size because I feel like they are to big for Lily but let me tell you, these are the perfect size for her and look absolutely adorable! Miranda's bows are very unique and definitely one of a kind! She's extremely talented and highly recommended! Miranda is giving one of my lucky followers a $15 bow credit to her Bowtique! DISCLAIMER: All products received are complimentary for testing purposes from Sweet Baby Bowtique. All opinions stated are my own and are not influenced by any affiliates. Since I am having another baby girl any day now, I love all the little baby hair bows in all the different colors. The polka dot ones are especially cute! All her bows are so cute! I love the style and all the colors but my favorite has to be the chevron design bows!! These are so precious! 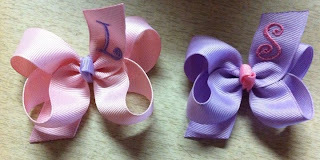 My niece's hair is just now getting long enough to wear bows, and these would look great on her! I have 2 girls and would LOVE these! I like the look of them! So pretty!!! My favorite thing is her unique bow style. I love how she creates her bows. Very sweet and elegant for a little girl. All her bows are cute! I love the chevron ribbon! The personalized ribbons are adorable, too. My 2nd daughter will be born everyday and I imagine we will do a lot of personalized items now. Ha.